− 4 = 1 Required Please enter the correct value. Futures for the Dow Jones Industrial Average today (Wednesday) are up 21 points as oil prices rose on speculation that crude inventories declined. Oil prices remain strained as concerns about oversupply increase following a meeting among members of OPEC. The global oil cartel recently chose to continue pumping oil at high volumes in order to protect market share. Despite the ongoing downturn, Money Morning Global Energy Specialist Dr. Kent Moors argues that OPEC will eventually change its opinion and that oil prices will rise in 2016. On Tuesday, the Dow Jones lost another 162 points as oil prices continued to sell off. Weakening Chinese data hinted the world is on the brink of another economic slowdown, which also contributed to the downturn. Today's worst performer on the S&P 500 was Exxon Mobil Corp. (NYSE: XOM), which slipped more than 2.8%. On Thursday, New Zealand is widely expected to cut its interest rates, a sign of the nation's weakening export business due to its exposure to China's stalling growth. The Stock Market Today: On Wednesday, oil prices will remain in focus again as the U.S. Energy Information Administration reports weekly crude inventory levels. Monthly reports on mortgage applications and wholesale trade will also be released. On the global front, pay attention to the New Zealand central bank's statement on interest rates and additional manufacturing data from China, which could offer further insight into the health of the global economy. Outsourcing Stinks: According to a report by the Economic Policy Institute (EPI), the import of goods by Wal-Mart Stores Inc. (NYSE: WMT) from China cost the United States at least 400,000 jobs between 2001 and 2013. EPI reports that Wal-Mart was responsible for roughly 15.3% of the nation's trade deficit with China during that time frame. 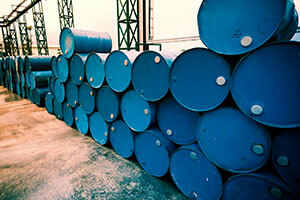 Oil Outlook: Oil prices were rising from seven-year lows on news that American Petroleum Institute reported inventories rose in the United States last week. January WTI prices added 2.1% to hit $38.30 per barrel. Meanwhile, Brent oil crude added 1.5% to hit $40.86. Keep an eye on the weekly crude inventory report from the Energy Information Administration. Earnings Report No. 1, LULU: Before the market opens, Lululemon Athletica Inc. (Nasdaq: LULU) will report third-quarter earnings. The yoga apparel company is expected to report per-share earnings of $0.37 on $481.61 million in revenue. Earnings Report No. 2, MW: After the market closes, Men's Wearhouse Inc. (NYSE: MW) will report third-quarter earnings. Wall Street expects that the men's fashion retailer will report an EPS of $0.50 on $868.5 million in revenue. Additional companies reporting earnings include Vera Bradley Inc. (Nasdaq: VRA), Korn/Ferry International (NYSE: KFY), Francesca's Holdings Corp. (Nasdaq: FRAN), and Layne Christensen Co. (Nasdaq: LAYN). Stocks to Watch No. 1, YHOO: Shares of Yahoo! Inc. (Nasdaq: YHOO) were moving this morning after the company's board of directors elected to not spin off its 384 million-share stake in Alibaba Group Holding Ltd. (Nasdaq: BABA). Yahoo is still expected to sell off its core Internet business in the near future should a proper suitor emerge. Recent reports have linked telecom giant Verizon Communications Inc. (NYSE: VZ). Stocks to Watch No. 2, KMI: Shares of Kinder Morgan Inc. (NYSE: KMI) cratered another 6.5% in pre-market hours on news that the energy giant planned to slash its quarterly dividend by 75%. The company will cut its dividend from $0.51 to $0.125. Stocks to Watch No. 3, DOW: This possible deal will keep the regulators busy. Reports indicate that Dow Chemical Co. (NYSE: DOW) and E I Du Pont De Nemours and Co. (NYSE: DD) are discussing a merger that could be valued at more than $120 billion. It would create the world's largest chemicals company by far. It is expected that the new company would then break up into several different publicly traded firms.